If you want FUN, FITNESS, FRIENDSHIP, come dance with us. Dorothy Hargreaves started the club in Deep Cove in 1986. She continues to be active in the Club and planned our 30th Anniversary celebrations in 2016. 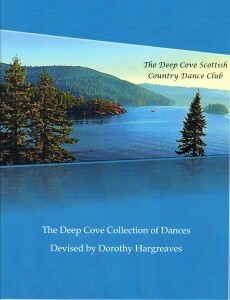 To mark the occasion, the members of the Deep Cove SCD Club published a book of dances devised by our founding teacher. Dorothy has created jigs, reels and strathspeys to interest everyone from beginners to advanced. The book is now available for purchase. Cost is $12. Contact Mary Ann McDevitt at mamcdevitt@shaw.ca or 604.929.2944. We now meet at Maplewood School, 420 Seymour River Place, North Vancouver, BC, just north east of the Second Narrows (Ironworkers Memorial) Bridge, opposite Maplewood Farm. The 2018-19 Season starts on Monday, September 17th for the Advanced Class and Tuesday, September 18th for the Beginner/Intermediate Class. The first class is free for new dancers. And the first Tuesday is our “Bring a Friend” night. Everyone is welcome! Our emphasis is to have fun, exercise in an enjoyable way, socialize with others and forget all our problems. We also provide an outlet for all those who love to dance but don’t have a willing partner. We change partners constantly, so you get to know everyone. 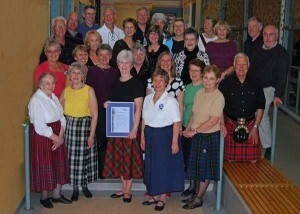 To dance with our group you do not need a partner, you do not need a kilt or to be Scottish. However you do need some soft comfortable shoes. (Sneakers are OK for Beginners.) You also need to wear cool clothing and bring your smiles. You will find our group most welcoming and you can attend the first class for free. After a few classes you may want to attend the many dances which are held around the area from September to May. You can also dance during the summer in Stanley Park. We hold a yearly dance in the Spring but there are many dances to go to throughout the year in the lower mainland, if you wish to do so. Scottish country dancing is a very social activity. We look forward to meeting you. Never a dull moment at the Deep Cove Class. 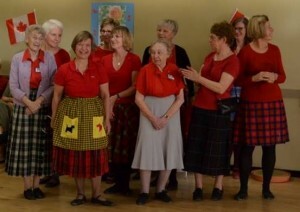 The Deep Cove Kitchen Crew at the Lady Aberdeen Tea Dance November 11, 2014. Louise (center) and Val (left) made countless party sandwiches for the afternoon tea enjoyed by 180 plus dancers. 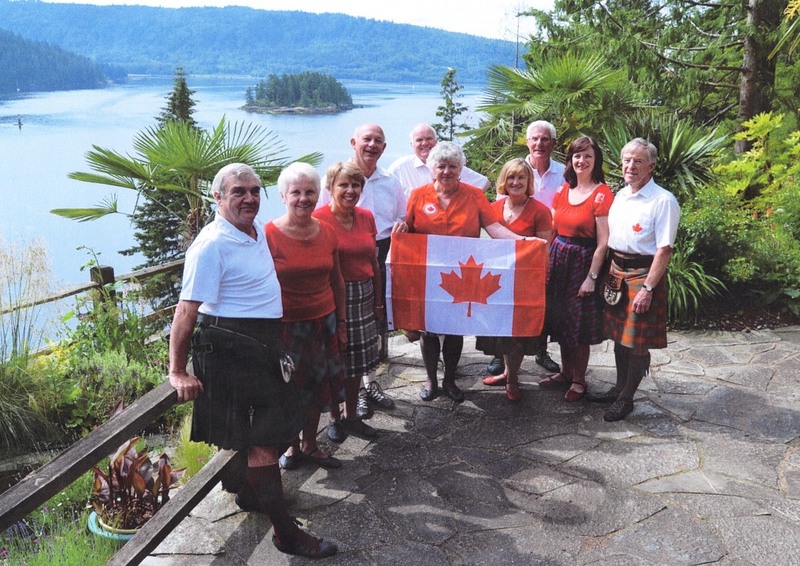 The Deep Cove Entertainment Team is available for special events and we can suggest pipers or highland dancers. We also have members willing to deliver “The Address to the Haggis” and “The Immortal Memory”, in fact, everything you need to hold a Burn’s Supper or other Scottish event.